Don't be ashamed if you've never used or even heard of iTunes U. It's a rare and acquired taste. While it might not be as flashy as app and music downloads, iTunes U is nevertheless an important tool for universities and their students. In its incarnation as an app, it's also far more appealing to everyday iTunes users with inquiring minds. iTunes U isn't a new service: it was announced in 2007 as a way for educational institutions to share content to their students and the world at large. Beginning with major universities such as Harvard and Yale, a wide range of courses are made available through iTunes U as audio and video files on the iTunes Store. Many of these can be subscribed to so users receive the latest classes as they are released. Courses available on iTunes U range from arts and literature to science and technology, and are the exact same lectures given to enrolled students at universities worldwide. This means, despite the fact you won't end up with a BA, MA or any other form of official educational certificate, you have the option to study an entire university course of your choosing with just an iTunes Store account as your gateway to entry. So, if you fancy yourself as a total swot or just want to learn about a topic that interests you, iTunes has long been a great place to head. iTunes U has its own section on the iTunes Store and allows you to search by university or a specific topic. And while there are plenty of deep and challenging courses on offer, there are a number of foundation courses too, so all education and experience levels are catered for. Since the initial fanfare at the launch of iTunes U, little has been mentioned of it in releases from Apple or in the press. But it has quietly continued introducing new content and new universities over the past few years. iTunes U now boasts a roster of more than a thousand universities and colleges, offering more than 500,000 audio and video files. And according to Eddy Cue (Apple's Senior Vice President of Internet Software and Services), iTunes U has seen 700 million downloads in the four years it has been around. Essentially a series of educational podcasts, any educational body can set up an iTunes U page for free and share courses with anyone wishing to download the content, which is also free. You would be forgiven for missing the announcement regarding iTunes U at Apple's January press event that (among other educational topics) primarily concerned iBooks textbooks. The mention was brief and the launch not as spectacular as the complete and free book-authoring platform, iBooks Author, but the new, free iTunes U app is certainly worth investigating. Rather than having to download and organise iTunes U courses through iTunes (which you can still do if you prefer) the iTunes U app now does much of the work for you - and more besides. Its key difference, by comparison to accessing iTunes U via iTunes, is how the information is sorted and delivered. Downloading a course through iTunes U is now like downloading an app within an app. Whereas you once had to sync lectures to your iPod, iPhone or iPad and search the web for related course materials and further reading, you can now access courses and materials right from your iOS device. The app is designed, as with Apple's iBooks and Newsstand apps, around a wooden bookshelf, and offers the same search and download experience as these apps, but for educational content. Courses within the iTunes U app are broken up into assignments such as passages to read, lectures to watch or tests to take, and now follow a more structured path with the emphasis on learning. 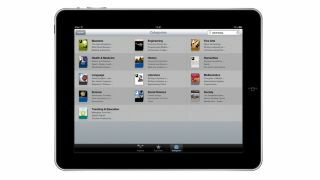 As well as lectures, iTunes U gives access to additional course materials such as books, links and apps. In effect, you get almost all the benefits of university learning without the debt. Accessing a course is now as simple as tapping on the Catalog button in the iTunes U app and selecting a topic that interests you. The preview of a course provides an overview of its key concepts, the option to subscribe for free as well as a list of the materials that will be required. Unfortunately, there are still a number of courses on the iTunes U catalog that are yet to be optimised for the app and therefore only offer individual lecture downloads and not materials or subscriptions. They can still be used with the iTunes U app, however, and most will likely see updates as the new format catches on. Once you're subscribed, the course appears in your iTunes U library with a badge on its cover to show how many posts are currently available within it. The badge number changes as you complete stages or when new stages become available. Inside each course you download is a textbook-style layout that includes tabs for different elements of the course. Tapping on the Info tab, for example, will provide you with an overview of the course, information on the instructor as well as a complete course outline. The university providing the content sets the structure of the course and also links to the materials required to complete it. More often than not, these are simply audio or video files but, on occasion, additional reading is required, so links to website and PDF files are also included under the Posts and Materials tabs within the iTunes U app's interface. These additional materials can also mean that a course isn't entirely free. For example, on occasion you may be pointed toward a book download from iBooks or even apps in some cases. Most of the time, however, the materials are free. The meat of a course is found under the Posts tab, with one post being an individual section of the course. Each post focuses on a specific topic and normally includes a video or audio lecture, additional reading, listening or viewing and a test that recaps what you've learned. Unlike using iTunes U through iTunes, materials such as lectures and PDF documents aren't downloaded automatically, so you will need to add them as you go by tapping the download button for each. There is, however, an option on the Settings menu under the Materials tab that enables you to turn automatic downloads on. It's also worth bearing in mind that, with most courses offering several lecture video or audio files, an iTunes U course will take up a lot of space on your iPad. If this is this case, materials you no longer need can be deleted by tapping the trash can that appears when you press the Info (i) button next to a material's description under the Posts or Materials tabs. You also have the option to stream audio and video lectures by tapping on them rather than downloading them. Each element within a post has a checkbox next to it, so you can mark the parts of the course you have completed before moving on to the next to keep track of your progress. As you read through books for the course in iBooks, you can also highlight and bookmark sections of interest that then appear in the iTunes U Notes tab for future reference. Within the Notes tab you can also add general notes or make additional notes on the book sections you have highlighted. This feature not only makes it easier to organise your learning but also helps you to study more efficiently by bringing all of your notes and important highlights together in one location. While only six universities (that had early access to the iTunes U app) currently offer courses compatible with the new format, there are already hundreds that users can choose from. And without doubt, there are plenty more on the horizon. It's also likely that those institutions with standard iTunes U content already available will update their materials to work better with the iTunes U app. This revamp of iTunes U is a testament to Apple's dedication to improving education and provides benefit to both students and others by not only offering access to world-class lectures but also the resources you need to completely follow the course and learn the topic. Now that downloading iTunes U courses isn't just about listening to or watching lectures, a new world of engagement has been created for those who may have tried and failed to learn with iTunes U before. Those without the time or funds to attend university can now enjoy a great deal of its benefits from the screen of their iPad. And while you can't put the results of your iTunes U learning on your CV, the knowledge you gain is no less important. You also don't get support from tutors or receive graded feedback with iTunes U but, for the amount of content available at no charge, the no-feedback-no-fees education isn't something to be sniffed at. While Apple is just as keen to promote the benefits of iTunes U to universities and students, those who want to study to further their understanding of a given topic will find it a remarkably handy resource. For prospective students and school leavers, iTunes U can be a great help when selecting courses or extending an existing education, as it allows a route to learn and research a topic or prepare for a course without financial restraints. So is iTunes U a hidden gem? While it was an impressive service already, the upgraded iTunes U is a one-stop educational shop for not only students and educators but the general public too. Whether you want to top up your knowledge, learn a new skill or find out more about a course you are interested in, iTunes U is the perfect place to do just that, and its outlet through a dedicated app only enhances the experience.